Tonight Sean and I ventured over to Steve's to continue painting our "A Call to Arms" squadrons. This time I inked each ship in blue to provide further texture and a base upon which to add additional detail. 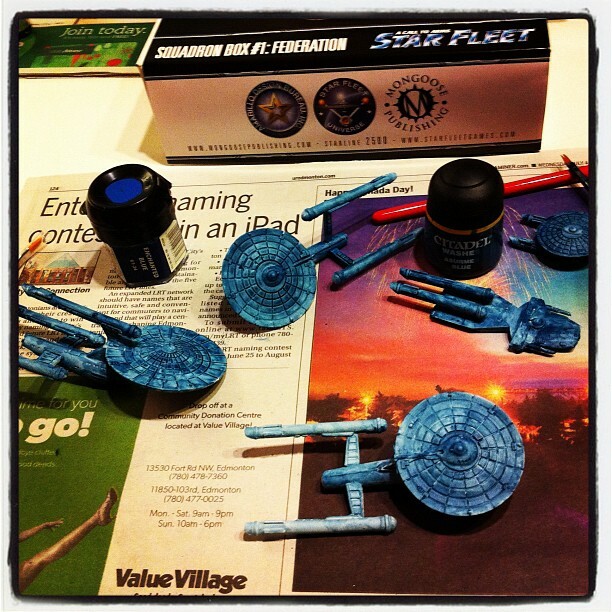 My brush strokes need work, but at least I successfully coated each ship without making too much mess. I dread painting on the ship names and registrations. The key to good, consistent brushwork is mostly practise. Make several dummy runs until you feel confident about your strokes. When I say several, I don't believe that several hundred may be out of the question. That's why painting is such a great hobby/tradecraft. Decent brushes also help. Either that or give Kieth Langergraber a call; he seems to have some talent you could explot.